On Thursday night, thousands are expected to be in attendance as England take on hosts the Netherlands in the semi-final of the European Championship. Back home, many more will tune in to Channel 4 or Eurosport to watch the match live. Players such as Steph Houghton have become familiar faces to beyond just aficionados of the women’s game, earning a professional living from the sport and making far more media appearances than past generations of female footballers. ‘Lionesses’ trends on social media when the side play, with celebs and plenty of former players from the men’s side among those posting good luck messages. While the attention may not be on a par with when England’s men reached the semi-final of major tournaments, it is hardly going unnoticed either. But back in 1984, England went all the way to the final of the forerunner to the current European Championship. Not that it’s exactly widely recalled across the country. 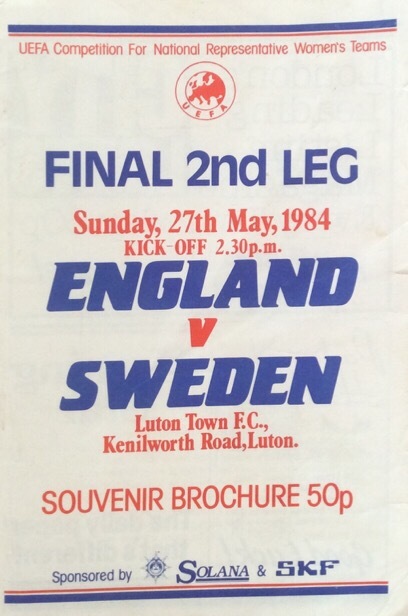 If you weren’t one of the 2,567 fans watching England and Sweden slug it out in the rain and mud during the second-leg of the final at Luton on a Sunday afternoon, then the odds are you saw very little of it given the lack of TV coverage in the UK. As we will recall, the advancement in media attention is not the only measure which shows how far the tournament and women’s football has progressed in the past 33 years. Although there had been previous European tournaments, the first officially recognised competition to decide the queens of Europe would run from 1982 to 1984. The European Championship? No, it was given the far less memorable name of the ‘European Competition for Representative Women’s Teams’. UEFA’s involvement was a sign of the women’s game starting to be welcomed more by the establishment, although as less than half of its member countries entered the competition could not be granted official status as a UEFA tournament. In keeping with how the female game was governed at the time, the England side fell under the Women’s Football Association rather than the FA and the team did not play in the same kit as the men. 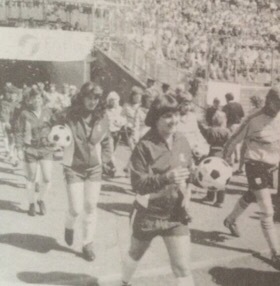 The women’s game in this country lacked the funding and external support that some of the more progressive nations such as Sweden were enjoying. There would also be no tournament as we would know it in a neutral country, not even for the final four sides. Instead matches would be played over two legs. In all, this was a competition well away from public view in England. The prospect of women being full-time professionals in England back then seemed inconceivable. The player profiles in the programme for the home-leg of the final sum this up, with such careers listed as commercial artist (Terry Wiseman), office clerk (Carol Thomas), civil servant (Linda Curl), sales assistant (Brenda Sempere) and, more unusually, electronics test engineer (Liz Deighan). Football would not be supplementing their income and leading players from that era would often face struggles getting time off work to represent their country. It was in keeping with how, because of their gender, they had encountered obstacles all along the way towards playing and would resent how boys could play football at school while they were made to play sports such as netball. Women playing football would attract bemusement and scepticism from some quarters, not least those in authority. A lengthy and controversial ban by the FA on women’s matches taking place in its affiliated stadiums was not lifted until as late as 1971, just eight years before Britain first had a female Prime Minister. Far few women’s teams existed then than now and media coverage was very limited, save for perhaps the odd short feature where the novelty of women playing football often seemed to be the emphasis. But for whatever scepticism was directed towards women’s football back in the early 1980s, it did not stop the England team being among the best. Some of the lesser nations would come in for thrashings when they took on the English and the side could hold their own with the more powerful names in the sport. It may not exactly have been front page news, but England’s women were making big strides towards potentially becoming European champions. The finals tournament at Euro 2017 has contained 16 teams after a further 30 went out in qualifying; back in 1982-84 there were just 16 entrants – a competition basically containing nations from Scandinavia, the British Isles and mainland Western Europe. There was not a single Eastern European representative, while Wales were among the absentees. The traditional European football minnows of the time – such as Cyprus, Luxembourg and Malta – did not feature. There were four qualifying groups, with the winner from each making the semi-finals. England were in a group with British Isles rivals Scotland, the Republic of Ireland and Northern Ireland. England’s campaign began in September 1982 with a home game against Northern Ireland and the 7-1 win set the trend for a dominant qualifying group display. They went on to win all six games, averaging four goals per game and not conceding any after that first match. Sweden, Italy and Denmark won the other three groups and it was the Danes who England would face in the last four over two legs. The home leg was played at Crewe, with just 1,000 fans seeing a 2-1 win that was followed up by a 1-0 triumph in the return. England were through to the final against Sweden. The first-leg of the final was played at one of Sweden’s leading stadiums, Ullevi, which just a year earlier had hosted Aberdeen’s victory over Real Madrid in the European Cup Winners’ Cup final and in 1992 would stage the final of of the men’s European Championship. 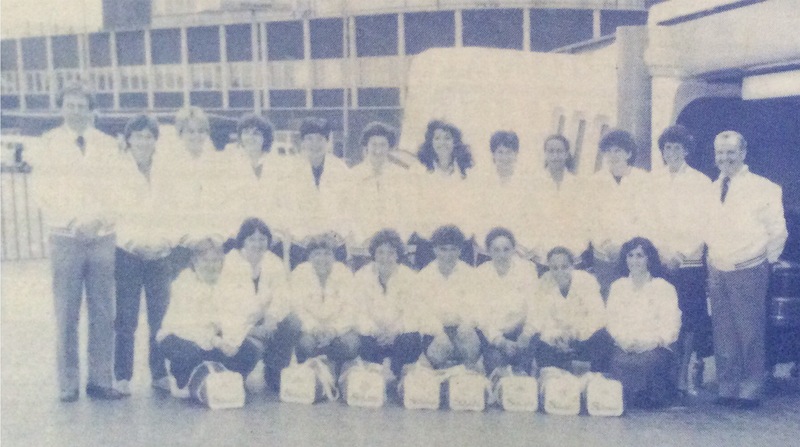 For England’s women in 1984, who were accustomed to playing internationals at lower league grounds, this was a big stage to appear on. A goal from Pia Sundhage gave Sweden victory, as England goalkeeper Terry Wiseman kept the score down with some vital saves. England and Sweden prepare to meet in Gothenburg. There would be envious glances from the England party as they saw how popular the women’s game was in Sweden, with plenty of support given to help with the progression of the sport and thousands of females participating in it. Powell would note how the match received an hour’s TV highlights in Sweden, with extensive newspaper coverage provided by the Swedish media after the return leg. By contrast, in the UK it was barely mentioned. The Times, for example, included a mere paragraph after the second-leg at the end of its round-up of the latest football news. The first-leg of the final was televised in Sweden. Eventually a club would come to the rescue, as Luton Town’s Kenilworth Road was made available. It was at least a top-flight stadium, albeit one hardly held in the same esteem as the homes of the nation’s glamour clubs. To add to the gloom, torrential rain turned the pitch into a quagmire. England and Sweden prepare to slug it out in the mud at Luton. England manager Martin Reagan would speak of the differences he saw in attitudes to women’s football in Sweden compared to back home, recognising how the work being done by the Scandinavians to develop youngsters would benefit their national team – and potentially punish England – in years to come. He wrote: “In England, there are few opportunities for girls under 16 to play football. In fact, many of them are actively discouraged from playing; even after that age, it can be far from easy to take up the game. Potentially we have in women’s football one of the largest team sports in this country, but unless we revise some of our attitudes towards it, we will have to watch our colleagues abroad draw further and further away from us.” Reagan, a war veteran who had played professional football for clubs including Shrewsbury Town and Norwich City, would thankfully see the progress he craved before he died last Christmas – but changes would not take effect overnight. The Swedes had deserved to win in the first-leg but England proved tougher opposition at Luton, taking the lead on the day through Linda Curl. With the aggregate scores level, the match went to penalties. Much has been made over the years about England’s men failing in shoot-outs but the women suffered such heartache first. 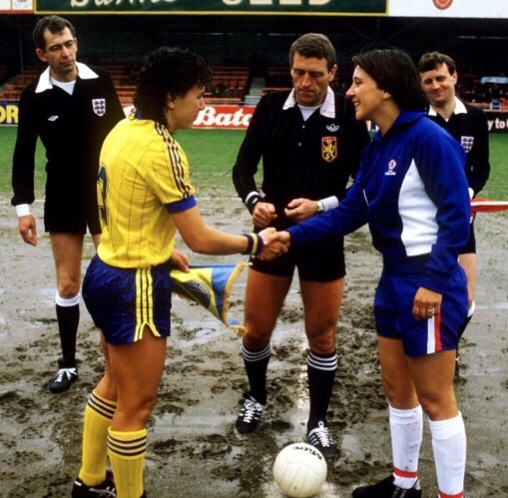 During the third-place match at the European Competition for Women’s Football in 1979 in Italy – considered an unofficial tournament as UEFA were not involved – England had lost on penalties to Sweden. The Swedes would again triumph in such circumstances at Kenilworth Road, Curl and Angela Gallimore failing to convert their penalties as England lost 4-3 and missed out on lifting silverware. For all the recent success of the Lionesses, 1984 remains the closest they have ever been to becoming European champions – a fact they will want to change in the coming days. 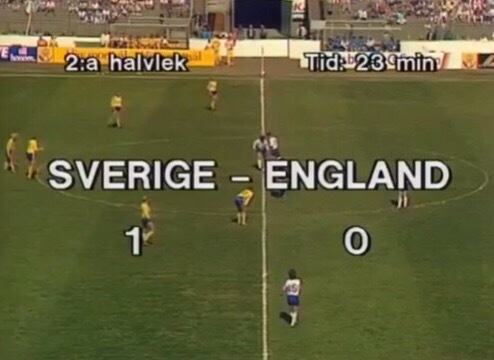 When the tournament was next played in 1987 the Swedes again proved England’s nemesis as they beat them in extra-time in the semi-final. England only reached the semi-finals once more before 2009 when they made the final in Finland, only to be crushed 6-2 by Germany. A disappointing tournament in 2013 marked the parting of the ways with Powell and perhaps showed how much more attention was now being paid to women’s football than almost 30 years earlier. Success for England this week can lead to that interest growing further.